Shaving can be a hassle, but it has to be done. If it’s not done correctly it is likely that you will experience razor bumps. These are bumps that appear when you shave with a dull razor or you don’t use enough shaving cream and water which means you are shaving with too much dryness. The most commonly occur in the bikini area since the skin is so sensitive. However, the bumps can appear in many other areas on your body as well. If you are suffering from razor bumps and you want them gone, here are some tips that will help you get rid of them in the best way possible. Don’t shave the hair again until you have allowed the bumps to heal and the hair to grow in again. If you shave over the bumps, it will end up tearing them open and irritating them further. This can end up causing an infection and you won’t even remove all of the hair. Allow the hair to grow back in and don’t shave in that area for a while. If you do this, it is likely that the bumps could end up clearing up all on their own. This means that you should try your best to refrain from scratching, shaving and having any type of rough contact with the bumps. If you scratch them, it could cause the bumps to spread and the problem could end up prolonging causing you a lot of discomfort. While they will be very itchy and the hair may bother you, you will be very thankful that you didn’t irritate them in the long run. There are many products out there that are made treat razor bumps. When looking for these products, you want to find one that includes the following ingredients: Aloe, salicylic acid, witch hazel, glycolic acid. The product should contain a least two of these ingredients. There are a number of different products which means that there are different ways that they will be applied. Find a product that will work best and make you feel most comfortable when applying it. You can use a product that has a roller ball where you will apply and roll it on directly to your skin. Or you can find a product where you apply it with your finger or a cotton swab. Be sure that you apply as directed by the product. It’s always best to apply it after you take a shower when your skin is clean and is most absorbent. If you scratch or shave the bumps and you find that there is infection, you can use antibacterial cream to help ensure the infection goes away. This is the easiest way to treat the problem without having to see a doctor or a dermatologist to get rid of the infection. If you notice scarring after there has been a lot of irritation and scratching, you can use Retin-A. Be sure that you don’t use this product if you are planning on getting a wax done in the near future. It will weaken your skin causing a lot more pain and tearing. Treating razor bumps can be a pain, so why not take steps to making sure that you never get them in the first place? 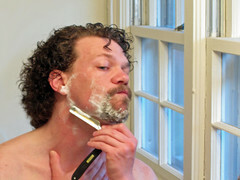 To prevent these bumps from occurring, it’s best to throw away all of your dull razors and buy new ones. You want razors that will remove your hair without any snagging or unnecessary pulling. This will cause irritation around your hair follicles, making razor bumps occur. Don’t shave every day either. It’s best to shave about twice a week, three times at the most. Use shaving cream as it will make your hair a lot softer, making them much easier to remove with a razor. If you don’t have shaving cream, use your conditioner or a very smooth soap. Don’t for get to moisturize after you shave but be very gentle! You want your skin to be as soft and smooth as possible and using the best razors and shaving cream possible will do the trick.